A-metal goes on market, and other odd metals find new uses as they step out of chemistry boohs into everyday living. WANT to buy some uranium? You can, now, for the A-metal’s on the market. Just explain to the New York licensing division of the U. S. Atomic Energy Commission what you want it for, satisfy them that you’re a reputable researcher, and you’ll get a license entitling you to send in an order. To meet legitimate needs, the AEC has authorized the sale of 200 pounds of uranium through normal commercial chemical channels. That’s news, because in recent years every available ounce of the silvery metal has been earmarked as a source of fissionable material for A-bombs and chain-reacting piles. Uranium metal is definitely in the luxury class, several times as expensive as silver, for it sells at about $50 a pound. But it’s still a bargain. The price would have been $1,000 eight years agoâ€”if available at all. The postman will bring the precious metal in an ordinary screw-cap cardboard mailing tube. It may come from the Mallin-krodt Chemical Works of St. Louis, Mo., which produces uranium from ore mined in the Colorado area, or from other chemical dealers supplied with it by this firm. One or more black sticks of solid uranium metal, four inches long and a little thicker than a lead pencil, will be in the package. (Although uranium resembles steel at first, it soon turns bronze, and then black, as exposure to air coats it with oxide.) Since uranium is one of the heaviest of metals, 18.7 times as dense as water, even those little rods weigh a quarter of a pound apiece. Uranium is radioactive, emitting alpha and beta rays. So the sticks come wrapped in ray-stopping lead foil to avoid any chance of fogging photographic film in the same mail. The rays from an unwrapped stick will make a shadowgraph of a key laid on film in a darkroom, and will swing a Geiger counter’s needle across its dial. But they are so mild and harmless that you can hold uranium in your hand with perfect safety. And in contrast with some radioactive materials, you needn’t hurry to use uranium while it lastsâ€”for its half life is a generous four and a half billion years! The uranium you get won’t be quite pure enough to use in an atomic pile, nor will it be artificially enriched in U-235 as an atom bomb requires. But that won’t matter to you, for Uncle Sam would frown on your running a private pile or making a bomb anyway. By ordinary standards it will be highly refined and suitable for whatever else you want to do with it. Several of the purchasers whose orders have already been filled, usually for a pound, or four sticks, of uranium metal, will use it to “shadow-cast” specimens for study with electron microscopes. Germs and equally tiny objects stand out clearly in relief under the microscope, with their true form emphasized by apparent shadows, after a thin film of a heavy metal is deposited obliquely on them in a vacuum. Of the metals tried to dateâ€”which include chromium, manganese, palladium, and goldâ€”uranium works best-Ostensibly for making steel alloys, Russia obtained 500 pounds of uranium-containing oxide from Canada in 1943, it was recently revealed. Whether that’s what they did with it, the record doesn’t showâ€”but it’s another possible application of uranium. 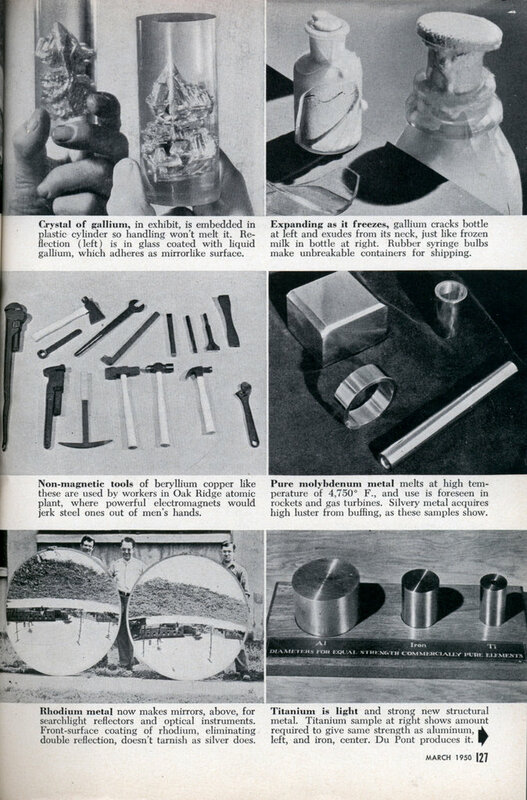 According to the U. S. Bureau of Mines “Minerals Yearbook” for 1941, “Uranium imparts desirable properties to tool steels. The metal is introduced as ferro-uranium, or as a master alloy containing 66 percent uranium and 33 percent nickel.” More recently, properties of uranium alloys with aluminum, tungsten, tantalum, manganese, and copper have been investigated and made the subject of several AEC reports. The uranium now for sale will permit wider studies of this kind. Physicists should find uranium metal a useful tool, the AEC suggests, to study the strange behavior of substances at extremely low temperatures, where their electrical resistance mysteriously vanishes. Formerly about the only known use for uranium and its chemical compounds was as a coloring agent for amber signal glass, yellowish-green “uranium glass,” and red and orange tile. 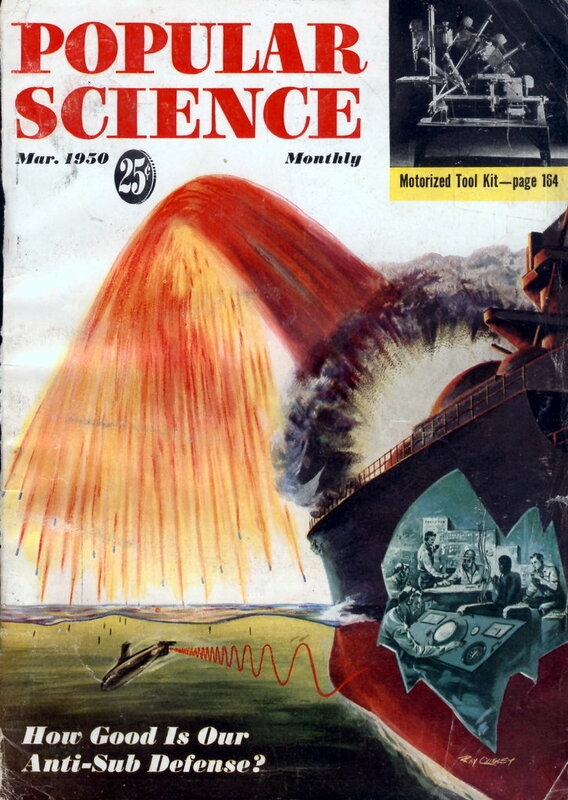 Said the 1940 pre-atomic-era edition of the yearbook already quoted: “Increased output of radium has raised again the question of disposing of the jointly recoverable uranium.” It’s come a long way, uranium has, since people wondered what to do with it! So have quite a few other rare or unfamiliar metals that until recently were only names in chemistry books. One of these days, if you haven’t already, you’ll be making the acquaintance of such up-and-coming metals as beryllium, gallium, germanium, lithium, molvbdenum, rhodium, sodium, and titanium. Pick up a piece of silvery gallium metal, and it melts in your hand! Like mercury, it liquefies at a temperature below body heat, 86Â° F. to be exact. Since it boils at a temperature far higher than mercury does, the queer metal has been used as a liquid in thermometers that register up to more than 1,800Â° F. New uses are expected to result from its recovery, just begun by the Aluminum Company of America, as a byproduct from the aluminum-bearing ore bauxite. One is in an extremely strong new dental alloy for fillings that won’t fall out. Did you ever see any molybdenum, not mixed in alloys like chrome-moly steel, but the pure stuff itself? Not long ago, West-inghouse learned how to produce the first 250-pound ingots. In contrast to gallium, molybdenum melts at the toplofty temperature of 4,750Â° F., nearly 2,000Â° above the melting point of iron. Hence engineers foresee molybdenum nozzles for rockets and blades for gas turbinesâ€”and, perhaps, firewalls to protect jet fliers from fire. Mirrors now get a coating of rhodium metal, better for “silvering” than silver. Called “poor man’s platinum” because it’s a less expensive member of the platinum group of metals, rhodium also gives a handsome plated finish to cigarette lighters and safety razors of well-known makes. Titanium’s the talk of the town when engineers get together. Although it’s heavier than lightweight magnesium alloys, it’s so much stronger that aircraft parts of half the . weight can be made from it. Silver-white and ductile, it’s even more corrosion-resistant than stainless steel, report interested experimenters of the Remington Arms Company. The ore is the fourth most plentiful of any structural metal’s, but how to get the metal out has been the $64 question, until National Bureau of Standards metallurgists recently hit the jackpot with a new method. Unusual metals mean unusual processes. One modern engineering stunt is to use liquid metal, like the water in your car’s cooling system, for cooling and heat transfer. The new atomic pile of the Knolls Atomic Power Laboratory near Schenectady, N. Y., will employ a “liquid-metal coolant” The particular metal or metals haven’t been revealed. But at Oak Ridge National Laboratory, they’ve tried out an experimental cooling system using an alloy of two rarely seen metals, sodium and potassium, in nearly equal parts. The odd alloy is liquid at ordinary room temperature, melting at about 59Â° F. Sodium-cooled valves, using sodium metal alone (melting point, 175-1/2Â° F.), have made possible high-power airplane engines. Because ordinary hammers and wrenches would be jerked right out of workers’ hands by the tremendously powerful electromagnets of the U-235 separation plant at Oak Ridge, Tenn., the men there use tools of beryllium copper. This non-magnetic, reddish-gold alloy of beryllium metal and copper is also non-sparking, so that the tools can be used safely in places like powder plants where sparks could cause an explosion. Production of pure beryllium metal, formerly a rare laboratory curiosity, has meanwhile been spurred on by its desirable properties as a structural material for atomic pilesâ€”although its dust is so toxic that it has to be machined within a ventilated glass box to protect the operator outside. “No use at all has been found for germanium,” said a book on metals 10 years ago. One of the latest and most promising metals to make headlines, germanium is now the key material that rectifies electric current in radio and radar circuits and in “transistors,” which may replace vacuum tubes. Lenses of germanium metal and of silicon metal, opaque to visible light but transmitting infrared or “black” light, have just been produced by a Purdue University group headed by Dr. Karl Lark-Horowitz. They promise spectacular advances in infrared equipment and possibly improved designs for military devices like the World War II “sniperscope,” used to see and aim guns in the dark with the aid of these rays. Incidentally, silicon is one of the commonest (in sand) but most rarely seen elements. About half as heavy as water, lithium is the lightest metal known. Lithium hydride, a grayish-blue to white crystalline compound of lithium and hydrogen, is correspondingly light. Carried in airplanes’ emergency equipment, the chemical helped save many lives in the last war. By reacting with water, it liberated hydrogen to fill balloons that carried radio antennas aloft from life rafts of fliers forced down at sea. The silver-white metal itself, hardly known outside the laboratory 10 years ago, now hardens lead and aluminum alloys. Its vapor, produced by heating a cartridge of lithium, protects sheet metal and machine parts undergoing heat treatment in furnaces. History will almost certainly repeat itself with other odd metals still awaiting use. Unmindful of immediate reward, the chemists and physicists carefully explore and catalog the properties of each one. Years or decades may go by. Then, one day, along comes an application requiring just such-and-such a melting temperature, density, or manner of chemical behaviorâ€”and another element steps out of the chemistry books into everyday living. This is still actually true. Labs all over the USA use radioactive materials that don’t even usually involve any paperwork. Tritium (HIGHLY CARCINOGENIC radioactive isotope of water) for instance, is used by the gallon (well, the pint maybe) in any DNA lab. Metal detectors contain highly radioactive bits of metal. Permanent-glow watch dials, which you can order thousands of from any wholesale parts place, or even order the paint used uses a radioactive isotope (classically, of Phosphorous). My father used to have some. He did watch repair as a hobby just before WWII, and so guess what he got to do in Alaska after the draft? Repair self-glowing aircraft dial instruments! He said all the “Chinese ladies” (with small fingers for such work), used to physically lick the tiny paintbrushes used to apply the dial plate markings, so they all died of mouth cancer in a few years. Vintage WWII army surplus equipment no longer glows though, since the P32 isotope used only lasted a few years. If I wanted some good poison for a dirty bomb, I’d raid the low-security food irradiation areas of vacuum packed food producers. I’ll bet the armed forces now irradiate meat and seal it thus. My father once described watching tons of the best filet mignon being dumped into a huge boiling tank. Mmmmm, boiled steak! I have to get this what is it called.